The Pittsburgh Zoo in Pittsburgh is a place where families, groups, and students can learn about animals, and develop a lifelong appreciation for wildlife. Through the zoo's exhibits, education programs, and active conservation efforts, it hopes to help keep Earth a suitable home for all species, and wishes to encourage zoo visitors to help the environment. The Pittsburgh Zoo opened in 1898, more as an animal menagerie with caged beasts. Over the last century the zoo has moved towards naturalistic habitats for all its wild creatures. The first effort to present animals in their native habitat was in 1937, when an outdoor area was created for the bears. In 1948, the exceptional children's zoo was opened; it has become a pre-eminent and admired zoo for younger children. The AquaZoo was opened in 1967; at the time it was the only aquarium in the state of Pennsylvania. 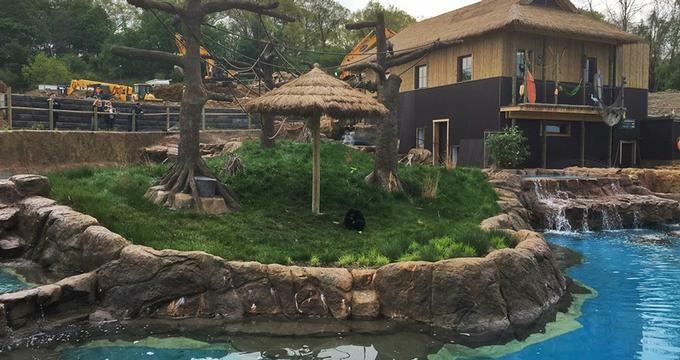 A strong movement to create natural environments for the zoo animals started in earnest in the 1980s. 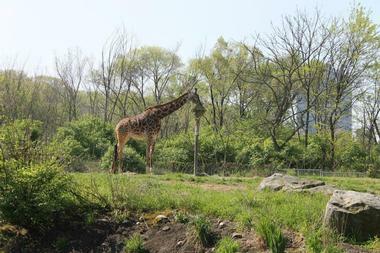 In 1983, the Asian Forest was opened, and the African Savanna was unveiled in 1987. The Tropical Forest, an indoor five-acre rainforest, was created and opened in 1991. It contains over 150 species of tropical plants, and is home to sixteen primate species. Public education about wildlife conservation is important to the Pittsburgh Zoo, and in 1994 this was reflected by the opening of the Education Complex, which at the time had five classrooms, a library, and a large lecture hall. It has since been expanded and renovated to allow more teaching and learning opportunities. The 21st century has brought more changes to the zoo. 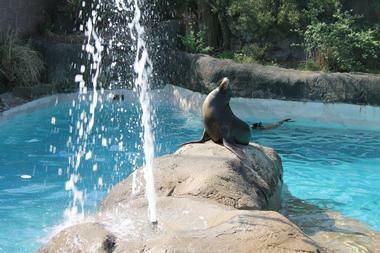 In 2007, the Pittsburgh Zoo launched The Water's Edge, which was designed with the ambience of a small coastal village. This habitat is home to the zoo's sea otters, polar bears, and sand tiger sharks. The zoo opened The Islands in 2015; this imaginative exhibit mimics a tropical island atmosphere, with waterfalls and ponds galore, and houses the zoo's most endangered animals. The African Savanna gives visitors the impression that they are walking along a riverbank through the plains of East Africa. In this area can be found African elephants weighing more than two tons; Masai giraffe, which reach 16 feet in height; zebras;the slender, critically endangered dama gazelle, native to the Sahara Desert; ostriches; flamingos; critically endangered black rhinos, which are actually brown or grey, and a trio of African big cats: lions, leopards, and cheetahs. The cheetahs have their own separate habitat, called Cheetah Valley; the habitat is encased in glass and allows zoo visitors to examine the cheetahs from several different angles. 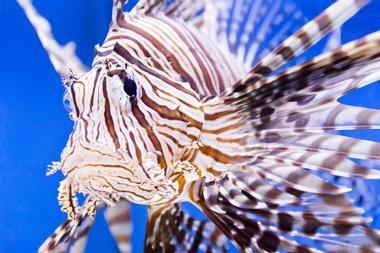 The Islands is home to the most seriously endangered species among the animals at the zoo. In this recreated tropical island habitat, complete with a sandy shore and beach chairs, visitors may view the Galapagos tortoises, which weigh up to 900 pounds; clouded leopards from the Himalayan mountains; Philippine crocodiles; Visayan warty pigs from the central Philippines, and siamangs, which are tree-dwelling gibbons native to the rainforests of Indonesia, Malaysia, and Thailand. The Tropical Forest is a 16-acre indoor habitat housing animals from tropical climates around the world. A crowd favorite is the rare Sumatran orangutan, and the Western lowland gorillas are also very popular. The Tropical Forest has two types of lemur; colobus, howler, capuchin, and blue monkeys; the small, shy two-toed sloths from Central and South America; gibbons, and poison dart frogs. Also at home here are the saki, a South American monkey that lives in the trees and only rarely comes to ground level, and the tamarin, which is a squirrel-sized monkey native to Central and South America. The Water's Edge is designed to look like a coastal fishing village in the Arctic, and illustrates how humans and animals interact. Here zoo visitors will find the polar bear, native to the cold wilderness of the Arctic Circle; sea otters, the thick-furred adorable marine mammals native to the North Pacific Ocean, and sand tiger sharks, docile nocturnal creatures of the world's deep oceans. Tunnels through The Water's Edge allow visitors to view the animals as if immersed in the water themselves. 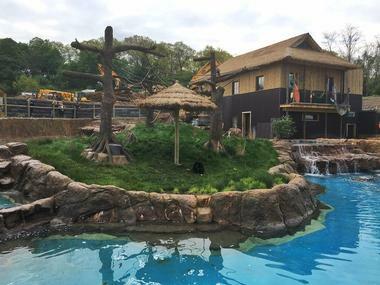 The Pittsburgh Zoo is working to obtain walruses to add to this habitat. The Asian Forest is dedicated to animals from Eastern and Southeastern Asia, and represents a journey from the Himalayas to Indonesia. The exhibit houses Asia's most critically endangered wild cats: the Amur leopard, the Amur tiger, and the snow leopard. Other Asian species are present as well, including the 10-foot long Komodo dragon, a huge species of lizard; the red panda, and the Chinese muntjac, a small deer native to southeastern China. The exhibits are fun to visit with the whole family. The PPG Aquarium, which was once called The AquaZoo, is a two-story building presenting several different aquatic habitats. One habitat features the varied fish that occupy the rivers of Pennsylvania; another contains a coral reef and its associated fish; there is also a penguin habitat with three kinds of penguin, and an exhibit of cephalopods, which include octopus, squid, and cuttlefish. There is a touch pool in the aquarium where visitors can pet gentle manta rays. The Kids Kingdom is considered to be one of the best children's zoos in North America. This interactive zoo zone has a petting zoo stocked with domesticated animals, a reptile house, a playground, and exhibits of wildlife from Pennsylvania, including white-tailed deer, wild turkeys, skunks, river otters, and the American beaver. The Animal Care Center is the Pittsburgh Zoo's veterinarian service. Above the Animal Care Center, visitors may look down upon the clinic from the Working Wild exhibit, which serves to promote interest in a career involved with animals. Exciting exhibits and interactive tools make this a great place to bring children. There are three food concession areas at the Pittsburgh Zoo. At The Village, which is at the entrance to the Zoo, there are both gift shops and food vendors. There is a picnic pavilion with benches and tables for visitors who have brought their own food with them. Food vendors sell a variety of items, including pizza, chicken tenders, hot dogs and corn dogs, beverages, cookies, popcorn, ice cream, cotton candy, wraps, sandwiches, and salads. In the Kids Kingdom, across from the kangaroo exhibit, there are more food concessions. Visitors may purchase hot dogs, potato chips, soft pretzels, pizza, salads, wraps, drinks, cookies, and soft-serve ice cream. Near The African Savanna area of the zoo is The Jambo Cafe. With both indoor and outdoor seating, the Jambo Cafe has thematic decor to give diners the illusion that they are eating in Africa. While eating, visitors may look out upon the cheetahs, elephants, zebras, and giraffes. The Jambo Cafe serves made-to-order salads, artisan pizza and sandwiches; gluten-free and vegetarian options are also available. The Pittsburgh Zoo offers Zoo Camps for children aged 2-13. Campers have the opportunity to meet wild animals close-up, to learn about conservation, about creating naturalistic zoo habitats for wild creatures, and about wildlife photography. Field trips for classes and children's organizations are offered, and the zoo's Zoomobile does animal outreach to classrooms, nursing homes, retirement homes, and seniors' centers. The Pittsburgh Zoo has an ATM, two first aid stations, water fountains, restrooms, three gift shops, food concessions, and a tram as an alternative to walking around the zoo. 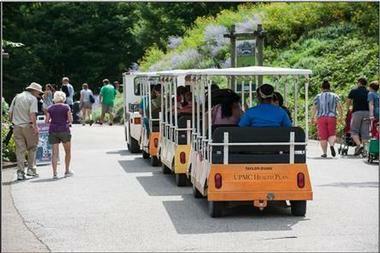 The Pittsburgh Zoo offers birthday parties for children between the ages of two and ten. Parties last between an hour and ninety minutes. There needs to be a minimum of fifteen people attending the party, and a maximum of thirty-five guests. The party package includes free zoo admission for all the guests, a meal choice of cheese pizza, hot dogs, or chicken nuggets, with potato chips, unlimited beverages, and a zoo-themed cake with a choice of batter. The zoo provides a gift for the birthday child, and a favor bag and safari hat for all the party guests. A la carte dining options are also available at an additional cost. Before and after the party, guests are free to enjoy the exhibits and animals at the zoo. The Pittsburgh Zoo offers dramatic backdrops for wedding receptions. Weddings may be held in the PPG Aquarium, amongst rainforest, waterfalls, and aquatic tiles; guests here dine with a view of sharks and tropical fish swimming through their tanks. Weddings may be held in the aquarium during the evening year-round. 200 seated guests can be accommodated. The Water's Edge has an elegant event room that is accessed by tunnels underneath the polar bear and sea otter habitats. 140 seated guests may be accommodated, and will be able to view marine life while they dine.